LIC Amulya Jeevan 2 Term Plan is a pure Economic Protection Plan. It gives a financial protection to the assured’s family on their sudden or unfortunate death. Everyone wants to give a financial security to their family. For this purpose, LIC Corporation introduced this LIC Amulya Jeevan II Protection Insurance Plan on 3rd February 2014. LIC Amulya Jeevan 823 Plan is pure Protection plan which protects the insured’s family in case of sudden death during the policy period. It is cheapest insurance plan which can afford to regular citizens. Every plan has some Features and Benefits. LIC Corporation has designed a set of rules under this scheme. For the better understanding of Life assured, we have provided some information regarding Features and Benefits under this Jeevan Amulya 823 plan. Check the Features of this Plan, so that you can complete knowledge on this plan. If the Policyholder doesn’t pay the premium within the time, the company will extend the time to pay the premium is a grace period. LIC Jeevan Amulya 823 Plan has the grace period of 30 days. Assured candidate can pay the premium within this Grace Period. If the insured candidate wants to return the policy within the Minimum Policy Term, no surrender value will be paid to the policyholder. If you are not satisfied with the Terms and Conditions of the Policy, you can return the LIC Jeevan Amulya 2 823 Plan within the 15 days from the Date of receipt of the Policy. LIC Jeevan Amulya Plan has some eligibility conditions regarding the entry age, sum assured, policy term, etc. Check the Eligibility conditions for the LIC Amulya 823 Term Insurance Plan. LIC Amulya Jeevan 2 Plan has some Premium rates per Rs.1000 sum assured. Go through the following table for complete details. Premium Rebate is available only for half Yearly mode. No Rebate is available for the yearly mode. For Half Yearly Mode: 2.0% more than the original premium. Sum Assured Rebate: No Rebate will be provided under this LIC Amulya Jeevan 2 Term Plan. To Calculate the Premium, you need some basic information like Name, Number, Email Id, Policy Term, etc. Based on the Policy Term and other parameters policyholders can you can calculate the LIC Amulya Jeevan 2 Premium. Mobile Number is given to the Corporation. The policyholder can visit the nearest LIC Branch Office to buy the Proposal form. Or you can go through the online to purchase the Policy. 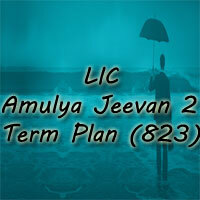 You can also get the LIC Jeevan Amulya 823 Plan through the Agent. Proposal Form No. 300 & 400 will be applicable under this plan. Nominees can claim for the LIC Jeevan Amulya II policy after the death of the policyholder. Because there is no Maturity/ Survival Benefit under this plan. No Surrender value will be provided under this LIC Amulya Jeevan 2 Term Plan. Payment of Claim: No Claims concession will be offered under this scheme. Tax Benefit: Tax Benefit is applicable for 12% of Service Tax. Within the same financial year, the policy can be backdated. No interest will be charged for this backdating. Revival Period: A lapsed Term Plan will be revived within the two consecutive years from the date of first unpaid premium. 61 Days and above Arrears of premium with interest thereon submission of proof of continued insurability. Nominations or Assignments are available under this plan. Policy Stamping Charges will be applicable for 20 paise for 1000 of total sum assured value. A. No, you can not surrender your policy before completion of the policy term. 2. Is there any loan benefits in this Jeevan Anmol 822 Plan? A: No, there is no loan facilities will be provided under this plan. 3. Is any Rider available for this policy? A. No, there are no special riders available for this plan.